Ectopic adrenocortical tissue may be present in many anatomical localizations. Hyperplasia, adenoma or carcinoma can occasionally develop from the ectopic adrenal tissue. Therefore, it should be surgically excised when it is detected. Adrenocortical tumors are the most common type of adrenal neoplasms. Ectopic adrenocortical adenomas are rarely seen. A total of 34 cases of ectopic adrenocortical adenoma (14 of which are oncocytomas) have been reported at different localizations in English literature. Most of them are non-functional. Differential diagnosis is required with other benign or malign oncocytic neoplasms. 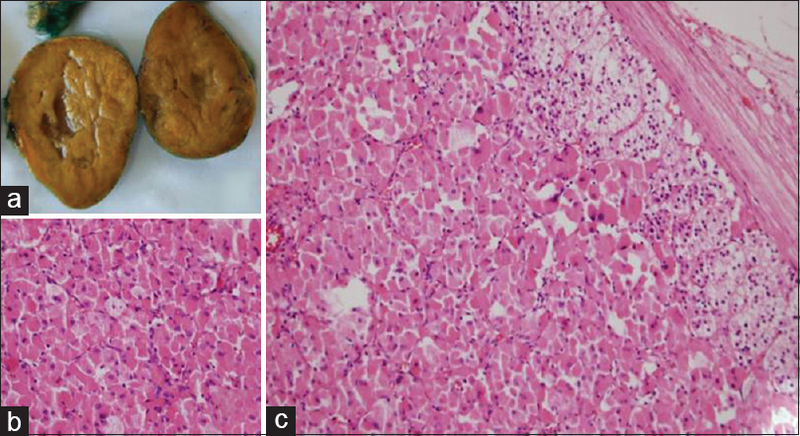 We report a 56-year-old male patient, who presented with a retroperitoneal mass. Our case is the seventh case of ectopic retroperitoneal adrenal adenoma with oncocytic cells. The term oncocytosis was first used by Hamperl in 1931. These oncocytic cells were defined in salivary gland tumors and were added to the American literature by Jaffe. However, these cells have already been described as cells, which show intense cytoplasmic staining and have a strong affinity for the eosin stain, in the thyroid and parathyroid glands by Askanazy and Welsh in 1898. Oncocytic changes are known as a morphological variation without a biological significance which can be seen in benign or malignant tumors of many regions such as the thyroid gland, parathyroid gland, kidney, adrenal gland, pituitary gland, pancreas, lung, nasal sinus, and salivary gland. The term oncocytoma is used for benign tumors that are formed by the arrangement of mitochondria-rich cells with large eosinophilic granular cytoplasm as tubular, alveolar, and solid patterns. Approximately 150 new cases of adrenal neoplasm have been described since the first case of adrenocortical oncocytoma described by Kakimoto et al. in 1986. Adrenocortical oncocytomas have a dark tan or mahogany brown cross section. They are mostly nonsecretory. When they are secretory, they may lead to virilization, feminization, or Cushing's syndrome with steroid hormones. Microscopically, they consist of cells with dense and granular eosinophilic cytoplasm. Lipid is absent or very rarely present in the cytoplasm. Electron microscopic examination shows a large amount of mitochondrial content. Adrenocortical tumors are the most common type of adrenal neoplasms and are seen in 1% of the general population. Its incidence increases with age. Ectopic adrenocortical adenomas develop from adrenal remnants that can be seen along the path of embryonic migration. So far, in English literature, a total of 34 cases of ectopic adrenocortical adenoma (14 of which are oncocytomas) have been reported at different localizations. Retroperitoneal localization and oncocytic features are very rarely seen and have been reported in only six cases. Retroperitoneal lesions primarily suggest a neoplasm originating from the kidney or adrenal glands. 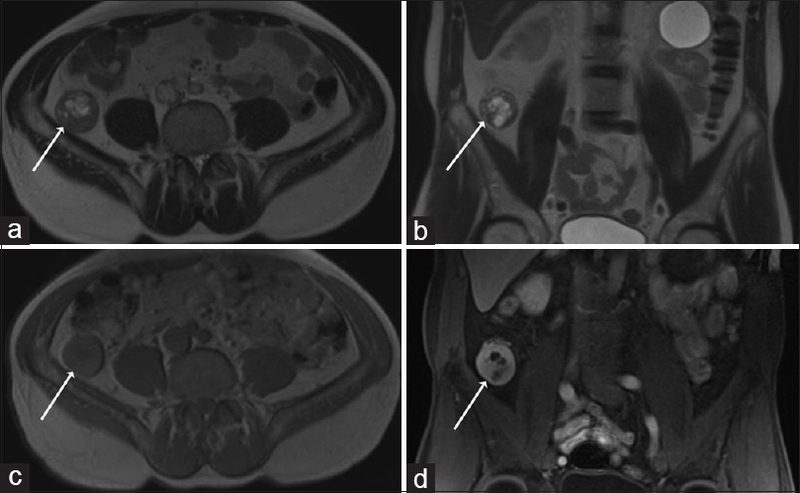 We report the seventh case in English literature of nonfunctioning oncocytic adrenocortical adenoma that was identified incidentally, was located retroperitoneally, and was unrelated to the kidney and adrenal glands on magnetic resonance imaging (MRI). A 56-year-old male patient submitted with orthopedic complaints. Sacroiliac joint MRI and lower abdominal MRI were taken [Figure 1]. The MRI scans revealed a 40 mm mass at the posteroinferior region of cecum. It was located in retroperitoneal fat tissue and showed limited heterogeneous contrast enhancement. Laboratory findings were unremarkable. No abnormalities were detected in tumor marker levels except for a slightly elevated carcinoembryonic antigen value. The patient did not have symptoms such as abdominal pain, constipation, nausea, and vomiting. The postoperative macroscopic appearance of the incidentally discovered asymptomatic 40 mm mass was round oval. It had a solid yellow-orange cross section [Figure 2]a. On microscopic examination, there were small nucleated polygonal cells which form sheets and nests and had eosinophilic granular cytoplasm (oncocytosis). The lesion was surrounded by a fibrous capsule [Figure 2]b. There was a network of fine capillaries in the stroma. There was no necrosis, mitosis, atypia, capsule, or vascular invasion. There was degenerative nuclear atypia in some cells and focal lymphoid aggregates in the stroma. 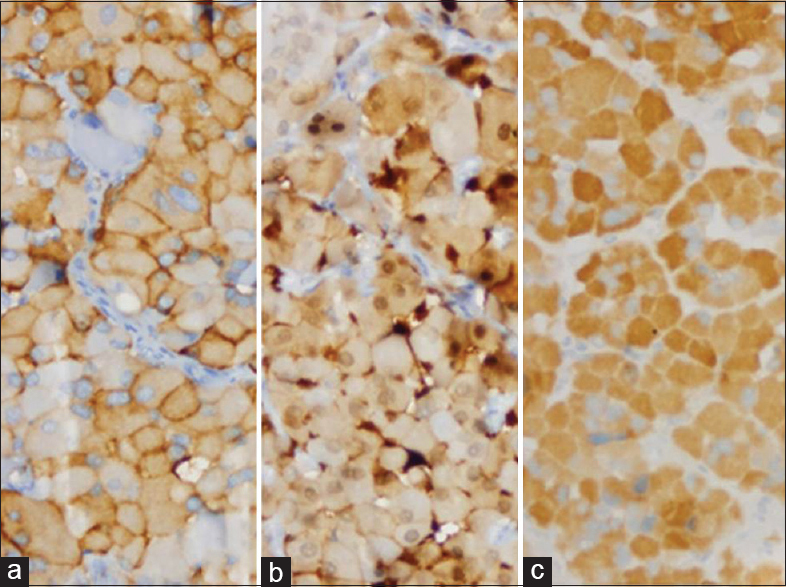 Residual ectopic adrenocortical gland tissue was seen under the capsule and was compressed by the lesion in several areas [Figure 2]c. Immunohistochemical findings revealed that neoplastic cells were positive for synaptophysin, calretinin, and Melan-A [Figure 3] and negative for chromogranin-A, CD163, S-100, TTF-1, GATA-3, D2-40, and inhibin alpha. The adrenal gland is derived from primordial mesenchyme in the wall of the dorsal coelom adjacent to the dorsal mesentery and urogenital structures. For this reason, the vast majority of ectopic adrenocortical tissues are often found along the path of embryonic migration within the urogenital tract. Ectopic adrenocortical tissue may also be present in many anatomical localizations such as the celiac plexus, kidney, testis, epididymis, broad ligament, canal of Nuck, hernia, hydrocele sac, mesoappendix, liver, lung, intradural distance, and brain. In the ectopic remnants of adrenal tissue, cortical tissue is usually seen alone or more rarely with medullary tissue. Hyperplasia, adenoma, or carcinoma can occasionally develop from the ectopic adrenal tissue. Therefore, it should be surgically excised when it is detected. Ectopic adrenocortical adenomas are rarely seen. In English literature, a total of 34 cases of ectopic adrenocortical adenoma have been described at different localizations so far. Fourteen cases of them contained oncocytic cells (oncocytic adrenocortical adenoma/oncocytoma). Eight cases were detected in the retroperitoneal space. Only six of these eight cases detected in the retroperitoneal region contains oncocytic cells [Table 1]. Our case is the seventh case which was located retroperitoneally and contained oncocytic cells. Most oncocytic tumors arising from endocrine organs are nonfunctional as in our case. They are often asymptomatic when they are nonfunctional. Therefore, they cannot be detected early and can reach large sizes. The fact that the present oncocytic neoplasm is ectopically located and is supported by the absence of relation with the kidney and adrenal glands in MRI. On microscopic examination, there was normal ectopic adrenal gland that was under the capsule and was compressed by the lesion in several areas. This finding also indicates that the neoplasm was originated from the adrenal cortex. Moreover, Melan-A, calretinin, and synaptophysin expressions obtained by immunohistochemical analysis support that the neoplasm was originated from the adrenal cortex. No hormonal activation was detected in our case. The only morphological differentiation between hormonally active and inactive adrenocortical adenomas may be the presence or absence of cortical atrophy in nonneoplastic adrenal gland. Corsi et al. reported that the adrenocortical origin of the neoplasm in the retroperitoneal site can be based on “3b-hydroxysteroid dehydrogenase” (a steroidogenic enzyme) immunostaining of oncocytic cells. In a case report published by Surrey et al., retroperitoneal oncocytoma was accompanied by myelolipoma. Most of adrenocortical oncocytomas are benign. Benign/malignant differentiation is important in oncocytic lesions located in the retroperitoneum. In malignant lesions, metastases from the kidney and adrenal glands should be first ruled out. To assess malignancy, Aubert et al. created the modified Weiss criteria by revising the findings of Weiss's study. Accordingly, 6 and more mitosis in 50 HPF (yes = 2 points and no = 0 point), presence of clear cytoplasm in >75% cells (yes = 2 points and no = 0 point), abnormal mitosis (yes = 1 point and no = 0 point), tumor necrosis (yes = 1 point and no = 0 point), and capsule invasion (yes = 1 point and no = 0 point) are assessed. A total score of 3 or more has been associated with malignant behavior. The differential diagnosis of oncocytic adrenocortical adenomas located in the retroperitoneum includes paraganglioma, Perivascular epithelioid cell tumor (PEComa), metastatic renal cell carcinoma, and oncocytic variant of metastatic thyroid carcinoma that can show oncocytic features. Immunohistochemical markers such as Bcl-2, calretinin, inhibin-A, SF-1, and Mart-1 are used in the diagnosis of adrenocortical adenomas. The normal catecholamine levels in plasma and urine, the lack of chromogranin expression, and the absence of clinical hypertension support oncocytoma. In paragangliomas, the neoplastic cells are negative for epithelial markers and positive for chromogranin-A, synaptophysin, and GATA3, and sustentacular cells show S100 positivity. Positivity for immunohistochemical markers such as PAX8, RCC, CD10, CD117, and vimentin helps in favor of RCC. Positivity for SMA and HMB45 is useful as the most sensitive immunohistochemical markers in the diagnosis of PEComas. In the presence of suspicious metastatic thyroid carcinoma, thyroglobulin, TTF-1, and PAX8 should be performed first. We have discussed here the cases of ectopic adrenocortical adenomas with oncocytic features and the differential diagnosis with the review of the literature. When oncocytic features are seen in cases of retroperitoneal mass, ectopic adrenocortical adenoma should be kept in mind. Hamperl H. Oncocytes and the so-called hurthle cell tumor. Arch Pathol 1950;49:563-70. Jaffe RH. Adenolymphoma [oncocytoma] of parotid gland. Am J Cancer 1932;16:1415-23. Kakimoto S, Yushita Y, Sanefuji T, Kondo A, Fujishima N, Kishikawa M, et al. Non-hormonal adrenocortical adenoma with oncocytoma-like appearances. Hinyokika Kiyo 1986;32:757-63. Corsi A, Riminucci M, Petrozza V, Collins MT, Natale ME, Cancrini A, et al. Incidentally detected giant oncocytoma arising in retroperitoneal heterotopic adrenal tissue. Arch Pathol Lab Med 2002;126:1118-22. Surrey LF, Thaker AA, Zhang PJ, Karakousis G, Feldman MD. Ectopic functioning adrenocortical oncocytic adenoma (oncocytoma) with myelolipoma causing virilization. Case Rep Pathol 2012;2012:326418. Aubert S, Wacrenier A, Leroy X, Devos P, Carnaille B, Proye C, et al. Weiss system revisited: A clinicopathologic and immunohistochemical study of 49 adrenocortical tumors. Am J Surg Pathol 2002;26:1612-9. Minamimoto R, Yamanaka S, Kawamoto M, Endoh M, Nishito R, Yoshida K, et al. High FDG uptake on oncocytoma located in the retroperitoneum mimicking malignancy. Clin Nucl Med 2007;32:582-3. Roy AA, Jameson C, Christmas TJ, Aslam Sohaib S. Retroperitoneal oncocytoma: Case report and review of the imaging features. Br J Radiol 2011; 84: e161-3. Nguyen GK, Vriend R, Ronaghan D, Lakey WH. Heterotopic adrenocortical oncocytoma. A case report with light and electron microscopic studies. Cancer 1992;70:2681-4.